Les Produits Murphco Ltée, a guarantee of quality. Created in 1996, Les Produits Murphco Ltée is a fully company dedicated to the roofing industry. It manufactures plumbing products (see catalog) standard or customized, for commercial and industrial roofers. Our workshops can custom make flashings, goosenecks and other metal parts for the roof. Les Produits Murphco Ltée. is a company well established in its market through both its equipment at the cutting edge of technology and its highly qualified personnel. Today, Les Produits Murphco Ltée. has a start of the art workshop and a fleet of modern trucks. Looking to the future, Les Produits Murphco Ltée remains at in the leading position in terms of new products and customer experience. A native of Kedgwick in New Brunswick, Mr. Savoie has over 50 years experience in the the roofing industry. A roofer himself, he now heads several successful companies. In 1983 he opened the Centre de toitures B & S Ltée and, in 1996, Les Produits Murphco Ltée., a company that manufactures copper roof drains. Mr. Savoie has always wished to have his own business. Today, it is with pride that he sees the third generation of his family participating in the operations of its companies thanks to the values ​​it has managed to transfer. For Mr. Savoie, the customer remains at the heart of the mission he was given. "I sell service," he likes to say. Johnny Savoie, VP Centre de toitures B & S Ltée. Responsible for all business activities of the Centre de toitures B & S Ltée., Johnny Savoie has over 25 years experience in the retail sale of roofing products. 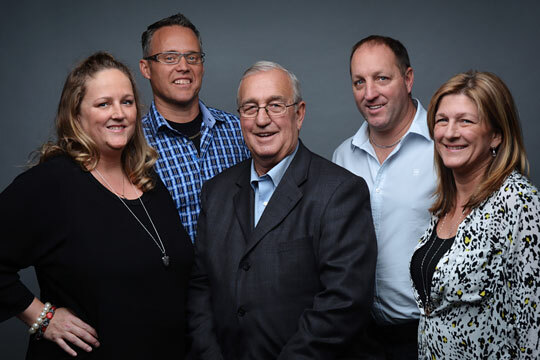 Involved in several community activities in Southwest of Montreal, Mr. Savoie has represented numerous times various causes such as the Accueil Bonneau and at minor hockey tournaments. Responsible for daily operations of the Montreal manufacturing plant for copper roof drains. She was successively controller and responsible for promotion. She is now in charge of purchasing, sales and communications for Les Produits Murphco Ltée and the Centre de toitures B & S Ltée. Known for his behavior and her hard work, Ms. Savoie is Director of Human Capital for ten years. As part of her duties, she also takes care of administrative issues and provides sales support at the Centre de toitures B & S Ltée. Trained as an Electrician, Jacques Leblanc climbed the positions to ultimately occupied the position of Vice President of Les Produits Murphco Ltée. Among the mandates it has been given, there is the modernization of the distribution center in Saint-Jean-sur-Richelieu and the supervision of its dailies activities.